Were Hedge Funds Right About Fleeing From UBS Group AG (UBS)? It was a rough fourth quarter for many hedge funds, which were naturally unable to overcome the big dip in the broad market, as the S&P 500 fell by about 4.8% during 2018 and average hedge fund losing about 1%. The Russell 2000, composed of smaller companies, performed even worse, trailing the S&P by more than 6 percentage points, as investors fled less-known quantities for safe havens. 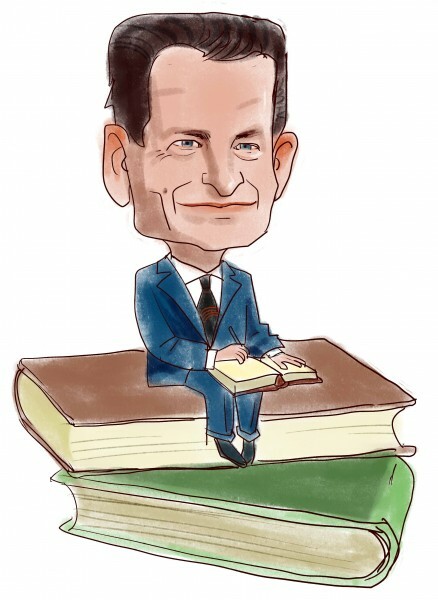 This was the case with hedge funds, who we heard were pulling money from the market amid the volatility, which included money from small-cap stocks, which they invest in at a higher rate than other investors. This action contributed to the greater decline in these stocks during the tumultuous period. We will study how this market volatility affected their sentiment towards UBS Group AG (NYSE:UBS) during the quarter below. Is UBS Group AG (NYSE:UBS) a buy right now? Investors who are in the know are taking a pessimistic view. The number of long hedge fund bets decreased by 3 lately. 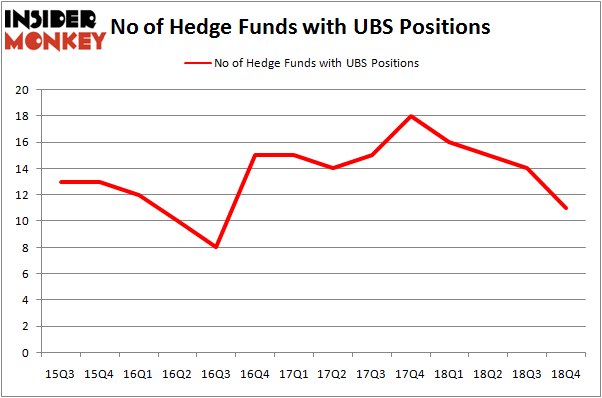 Our calculations also showed that UBS isn’t among the 30 most popular stocks among hedge funds. UBS was in 11 hedge funds’ portfolios at the end of the fourth quarter of 2018. There were 14 hedge funds in our database with UBS holdings at the end of the previous quarter. Let’s take a look at the recent hedge fund action surrounding UBS Group AG (NYSE:UBS). What does the smart money think about UBS Group AG (NYSE:UBS)? At the end of the fourth quarter, a total of 11 of the hedge funds tracked by Insider Monkey held long positions in this stock, a change of -21% from one quarter earlier. By comparison, 16 hedge funds held shares or bullish call options in UBS a year ago. With hedgies’ sentiment swirling, there exists a select group of notable hedge fund managers who were upping their holdings significantly (or already accumulated large positions). Among these funds, Fisher Asset Management held the most valuable stake in UBS Group AG (NYSE:UBS), which was worth $604.5 million at the end of the third quarter. On the second spot was Pzena Investment Management which amassed $96.9 million worth of shares. Moreover, Polar Capital, Citadel Investment Group, and D E Shaw were also bullish on UBS Group AG (NYSE:UBS), allocating a large percentage of their portfolios to this stock. Judging by the fact that UBS Group AG (NYSE:UBS) has experienced a decline in interest from hedge fund managers, logic holds that there is a sect of hedge funds who sold off their full holdings last quarter. At the top of the heap, Nick Niell’s Arrowgrass Capital Partners dumped the biggest stake of all the hedgies monitored by Insider Monkey, totaling an estimated $7.8 million in stock. Dmitry Balyasny’s fund, Balyasny Asset Management, also dumped its stock, about $3.6 million worth. These moves are important to note, as aggregate hedge fund interest was cut by 3 funds last quarter. Let’s check out hedge fund activity in other stocks – not necessarily in the same industry as UBS Group AG (NYSE:UBS) but similarly valued. These stocks are Prudential Public Limited Company (NYSE:PUK), Sumitomo Mitsui Financial Grp, Inc. (NYSE:SMFG), Lloyds Banking Group PLC (NYSE:LYG), and The Southern Company (NYSE:SO). This group of stocks’ market caps match UBS’s market cap. As you can see these stocks had an average of 12.5 hedge funds with bullish positions and the average amount invested in these stocks was $301 million. That figure was $740 million in UBS’s case. The Southern Company (NYSE:SO) is the most popular stock in this table. On the other hand Prudential Public Limited Company (NYSE:PUK) is the least popular one with only 9 bullish hedge fund positions. UBS Group AG (NYSE:UBS) is not the least popular stock in this group but hedge fund interest is still below average. This is a slightly negative signal and we’d rather spend our time researching stocks that hedge funds are piling on. Our calculations showed that top 15 most popular stocks among hedge funds returned 19.7% through March 15th and outperformed the S&P 500 ETF (SPY) by 6.6 percentage points. Unfortunately UBS wasn’t in this group. Hedge funds that bet on UBS were disappointed as the stock lost 1.2% and underperformed the market. If you are interested in investing in large cap stocks, you should check out the top 15 hedge fund stocks as 13 of these outperformed the market. Do Hedge Funds Love Diageo plc (DEO)? Hedge Funds Have Never Been This Bullish On Thermo Fisher Scientific Inc. (... Were Hedge Funds Right About Buying Costco Wholesale Corporation (COST)? Itau Unibanco Holding SA (ITUB): Are Hedge Funds Right About This Stock? Were Hedge Funds Right About Buying United Technologies Corporation (UTX)? Were Hedge Funds Right About Dumping Twenty-First Century Fox Inc (FOX)?